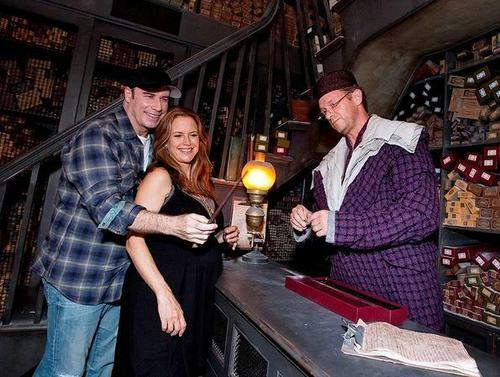 A Very Pregnant Kelly Preston and John Travolta visit The Wizarding World of Harry Potter . Sporting a burgeoning belly was 47-year-old actress Kelly Preston, who was glowing during a visit to The Wizarding World of Harry Potter at the Universal Orlando Resort with her husband John Travolta last Sunday. Wallpaper and background images in the Celebrity Couples club tagged: couple 2010 kelly preston john travolta pregnant out and about disneyworld.